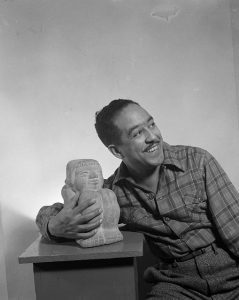 Langston Hughes made his mark at the forefront of Harlem Renaissance literature and became the first African-American writer to support himself fully with writing, a career spanning over four decades. His eloquent writing continues to resonate with readers because his words sing of universal hopes and dreams. His iconic poetry is infused with the musical rhythms of blues & jazz. His award-winning debut novel Not Without Laughter is semi-autobiographical, reflecting his childhood experiences—coming-of-age in Lawrence during segregation. He lived with his grandmother in Lawrence for most of his childhood. 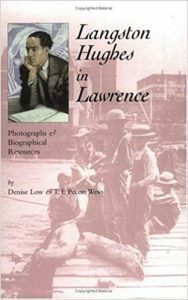 A wonderful resource for discovering more about Hughes’s childhood and the inspiring legacy of his diverse family heritage is available in the book Langston Hughes in Lawrenceopens a new window by Denise Low and Thomas Pecore Weso. Low and Weso reveal that his family included abolitionist leaders who supported John Brown and the end of slavery, and his ancestry included African-American, American Indian, and European roots. Championing a great author’s works in the city where he grew up is a natural way to demonstrate pride of place while also celebrating that author. 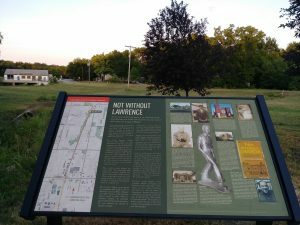 Many landmarks in Lawrence reflect Langston Hughes's connections here. 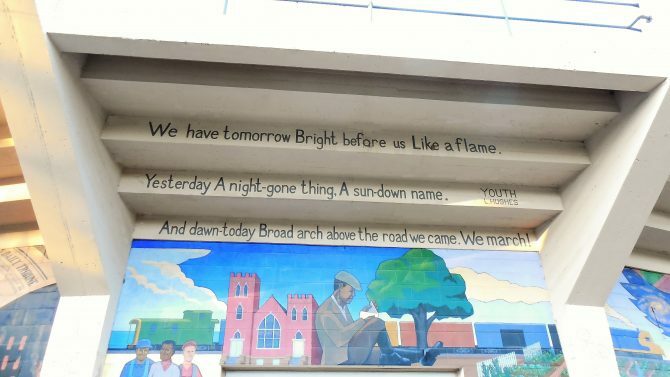 The first line of his poem "Youth" is even quoted on the outer walls of Lawrence's City Hall building. The poem "Youth," quoted above and "Merry-Go-Round," below, are included in the illustrated book Poetry for Young People: Langston Hughesopens a new window. Both poems really sing to me and connect to this poet’s childhood. "Merry-Go-Round" provides a richer understanding of a child’s feelings of pain and confusion experienced from Jim Crow segregation. Can't sit side by side. There's a Jim Crow car. For a kid that's black? I’m not familiar with the Lawrence school curriculum, but I feel like every young adult in Lawrence would benefit by reading and discussing the book Not Without Laughter. 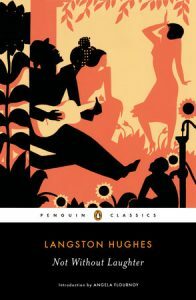 There is a lot of understanding to be gained in empathizing with the characters as well as appreciating this novel as classic regional literature. More still, a big documentary project is in the works, a collaboration of the Lawrence Arts Center with many scholars from KU and Yale, being funded by a grant from the National Endowment for the Humanities. The tentative release date of the full-length film is early 2020; more about the project can be found here. I have a deep gratitude for this author’s thoughtful, visually-descriptive and plain spoken words; he speaks to everyday people like me. And his work has lead a way forward for social justice before we had a worn path to follow. 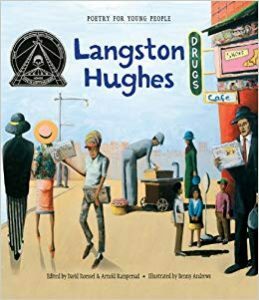 There is much more to learn from Langston Hughes's works and the murals and other ways Lawrence has honored our most profound and prolific local author. Let our memories live on as we continue to celebrate “bright before us like a flame”! - Shirley Braunlich is a Readers' Services Assistant at Lawrence Public Library.